Kaiwiki Homestead sometime between 1911 and 1920. Photo courtesy of Kim Kohl, granddaugher of William Ross, Hakalau Store, clerk in 1902, manager from 1903-1935. The flatlands and the river and stream valleys and gullies of the northeastern part of the island of Hawai`i were important agricultural lands in traditional times. Important crops such as taro, bananas, sugar cane, coconuts, sweet potatoes, `awa, and bamboo were cultivated. Hakalau played a major role in Hawaiian History. Hakalau was the site of a great landing and battle by Kamehameha and Kekuhaupi`o against the warriors of Maui circa 1791. This is a seminal event in Kamehameha's rise to power and unification of the Hawaiian Islands. What happened there led to Kamehameha being sent to the Naha stone. This was a very significant event (see Kamehameha and his Warrior, by Stephen Desha, May 2000, Chapter 3, page 66-77). The Great Māhele ("to divide or portion") or just the Māhele was the Hawaiian land redistribution proposed by King Kamehameha III in the 1830s and enacted in 1848. The entire ahupua‘a of Hakalau was awarded to Keahikuni-i- Kekau‘ōno﻿hi as Land Commission Award 1121. Keahikuni-i- Kekau‘ōnohi was the granddaughter of Kamehameha I. She was a chiefess representing both Hawai‘i Island and Maui royal lineage. Upon her death, her land holdings were inherited by her husband, Ha‘alelea. Ha‘alelea passed away in 1864. 1866: Hakalau Ahupua‘a was put up for auction, along with other land he owned, to pay the debts of the late Ha`alelea. 1870: Honohina Ahupua`a was put up for auction. 1873: Isabella Bird travels to the Sandwich Islands and recounts her experience crossing the Hakalau Gulch by horseback in Six Months in the Sandwich Islands. 1878: Claus Spreckles established Hakalau Sugar Plantation, with W.G Irwin and Company as agent. 1879-1881: First mill at the Hakalau Sugar Plantation built by John A. Scott. 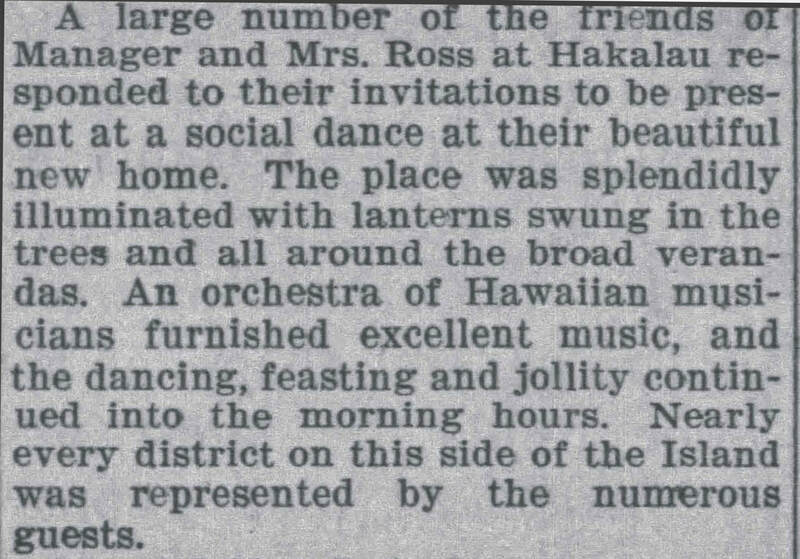 1890: George Ross hired as Manager of Hakalau Plantation. He served as manager until August 1905, retiring due to poor health. 1895: John Ross, brother of George Ross, hired (Hakalau Plantation Manager from 1905 - 1942). The first Hakalau Sugar Mill was torn down along with the sugar mill at Honohina. 1897: Plantation Manager’s house built while George Ross was manager. The 1920's signified a period of growth in which 32% of camp dwellings were built (tabulated from the insurance valuation files from the early to mid-1950s). A variety of other facilities were built as well, including an office building, a store replacing an earlier one, warehouses, and other facilities to support the business, and sanitation facilities and domestic water supply to support quality of life for workers. Issues related to the workforce became prominent including the need for higher worker pay and its financial consequences for the plantation; changing expectations and demands of the workforce related to both living and working conditions; and greater attention to the availability of workers and their level of satisfaction/discontent. The 1960's marked the end of the Hakalau Plantation Company as a separate corporate entity when it became part of the Pepeekeo Sugar Company, and later part of Mauna Kea Sugar. On the positive side, stockholders received their first payment of dividends since 1948. Pressures to reduce costs continued, with some success achieved through reduction in harvesting costs. As a consequence of the merger, capital improvements to the Hakalau Mill were not made and mill performance declined. Camps continued to be vacated with homes sold on a removal basis. ​​By the end of the decade, International Utilities Corporation achieved controlling interest in C. Brewer. 1994: The last harvest of cane on the lands of the former Hakalau Plantation. C. Brewer held on to this land for a while, leasing it to small farmers and even giving free five-year leases to its displaced workers. 2001: C. Brewer put all 21,000 acres of its Hamakua Coast property on the seller’s block. The land was snapped up, mostly by bulk buyers who began reselling it in smaller parcels. Plantation land on the Hamakua side of Chin Chuck Road was subdivided into ten acre lots and sold for about $17,000 per acre. The Hilo side of Chin Chuck Road had been sold previously ​as homestead land. 2004: The County of Hawaii Windward Planning Commission approved the Special Management Area Use Permit for the creation of Hakalau Plantation Village, what had previously been Hakalau Upper Camp, or "Up Camp". This subdivision consists of 22 lots, most of which are about 17,000 square feet. Hakalau Lower Camp, or "Down Camp", was sold in bigger plots. 2015: The County of Hawaii Windward Planning Commission approved the Special Management Area Use Permit for 10 lots makai side of the Hawaii Belt Highway in Ninole at Mile Marker 19.